Issued Jan. 8, 2002, to Namco, Ltd. The ‘861 patent provides a video game system where it encourages players to join together and play a multiplayer mode. The game has a maximum number of stages that a player can advance to by playing in single player mode. If the player wants to advance to further levels he must play against an opponent. The invention is described as only advancing the player in the game with the higher score. Thus, a player who wishes to complete all the levels of the game must find an opponent and then subsequently beat that opponent to advance. The game can be used in an arcade set up. In this fashion, the player who loses can remain on the current level if he pays another coin. After paying the coin, the player can then compete against another opponent in hopes of winning so he can advance to the next level. The objective of the present invention is to provide a game machine and information storage medium that make it possible to encourage players who have selected multi-player mode to continue playing. The maximum number of game stages that can be cleared by players in multi-player mode is set to be greater than the maximum number of game stages that can be cleared by a player in single-player mode. In single-player mode, the game is over at the point at which each course is cleared. In multi-player mode, a continuation privilege in the next course (a course that is more difficult) is granted when the current course is cleared. The privilege to continue playing the next course is granted to the player with the higher score, and is also given at a certain probability to the player with the lower score. 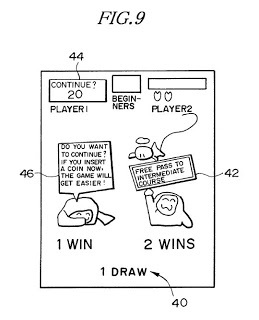 The player who was not granted the play continuation privilege is allowed to continue playing on condition that a coin is paid, and also an encouragement screen is displayed to induce this payment for play continuation. means for making a maximum number of game stages that can be cleared by players in a multi-player mode played by a plurality of players greater than a maximum number of game stages that can be cleared by a player in a single-player mode played by a single player.